In every modern naval fleet, destroyers play critical role due to their versatility, agility, fire power and longer reach. Introduced at the beginnings of 20th century as Torpedo Boat Destroyers" (TBD) were "large, swift, and powerfully armed torpedo boats designed to destroy other torpedo boats. After Russo-Japanese War, destroyers began to evolve as true long range multi-mission ships. Two World Wars during the last century played a critical role in evolution of destroyers. Aerial threat and advanced German U-boats, emerged as a nightmare for the Allied navies. This forced naval engineers and ship designers to come with the new designs of destroyers giving it capability against these two new threats. They were fitted with new anti-aircraft guns, radar, and forward-launched ASW weapons, in addition to their existing light guns, depth charges, and torpedoes. After the World War II, the advent of guided missile was a major advancement in maritime warfare allowing the destroyers to expand their combatant roles and taking over the missions previously fulfilled by much larger ships i.e. battleships and cruisers. This expansion of operational capability of destroyers, for the first time, allowed them to perform independent operations as well. Today, only few nations have the capability to design, build and commission guided missile destroyers. The operational orbit of destroyer today, includes land attacks and strike missions (through cruise missiles), fleet defense against aerial threats (through on board long range radars and SAM system), anti-submarine (through torpedo) and anti-ship operations (through anti-ship missiles). Earlier generation of naval destroyers were not multi-mission capable. They were either fleet air defense ship or ballistic missile ship. County Class of UK and Kashin Class of USSR, introduced in 1958-60, were basically air defense destroyer designs. As the miniaturization of nuclear war-heads has turned cruise missiles into nuclear cruise missiles, guided missile destroyers have emerged as supplementary platform for any nation’s nuclear triad strengthening its 2nd strike capability. Along with the evolution of missiles, radars and onboard sensors of a destroyer, the missile launchers have evolved as well. From early single and twin arm launchers (MK 13 & MK 11) to modern Vertical Launch System (MK 41 VLS), this evolution of launchers has enabled the modern ships to carry a lot more guided missiles (both SAM and SSM) in the form of a missile magazine. Despite all their multi mission nature, fact remains that destroyers due to their larger size can be detected by enemy submarines and Maritime Patrol Aircraft (MPA). In order to overcome this intrinsic shortcoming of destroyers, stealth factor was introduced in the design philosophy of the destroyers. Today, Indian Navy is operating 'Rajput' class (5000 tons), 'Delhi' class (6700 tons) and Kolkata Class (7400 tons) guided missile destroyers along with number of guided missile frigates. First two classes of ships are of conventional design and offer very little to no capability to evade enemy ships tracking them in open sea. Rajput Class destroyers (INS Rajput, INS Rana, INS Ranjit, INS Ranvir, INS Ranvijay) are Russian built. In late 1970s, after scrapping British built R Class and Hunt Class destroyers, the Indian Navy initiated ‘Project-15’ to design and build indigenous destroyers later to be known as 'Delhi' Class. The project was executed by Mazagon Dockyard Limited (MDL). It took some 20 years for MDL to deliver first ship (INS Delhi) to Indian Navy for commissioning in 1997. Subsequently two more ships (INS Mysore and INS Mumbai) were built and commissioned in Indian Navy in 1999 and 2001 respectively. Having influences of both Soviet and Western ships, Delhi class can operate in complete Nuclear, Biological and Chemical (NBC) environment. The ship is equipped with Kh-35 'Switchblade' anti-ship missiles (Range 130 Km) and its air defense system is being upgraded with Israeli Barak-1 SAM system (Range 32 Km). As a fellow up of the Delhi class, Indian Navy in May 2000, MDL began work on Project-15A. This was the evolution for Indian shipbuilding industry and major aspect of new project was inclusion of stealth features in the ship design. While pursuing that, more than 2000 modifications were made in Delhi class design. After these modifications, a new class of Indian destroyers (Kolkata Class) emerged. Kolkata class incorporated the latest technologies in sensors, weapons and navigation controls of the ship. Main weapon is Indo-Russian supersonic BrahMos cruise missile (2 x 8 cells). In air defense role, the ship would be fitted with Israeli made Barak-8 SAM system (Range 70 Km). 32 of these missiles would be carried in VLS launch magazine. Israel also provided main sensors and processing systems for this class of ship. The first of Kolkata class was commissioned in August 2014. The remaining two - Kochi and Chennai - are expected to join service by early 2016. Right now, Kolkata class destroyers are the biggest destroyer ships designed and built in India. Just like Delhi class, Kolkata class also has a follow on design project known as ‘Project 15-B’ or Vishakhapatnam Class. 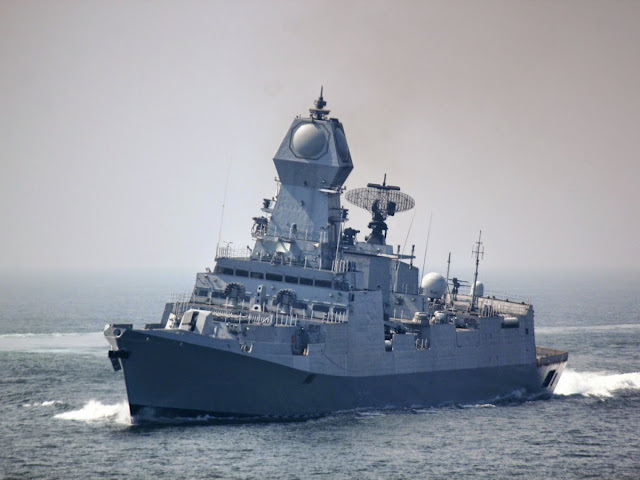 MDL launched INS Vishakhapatnam, the first of four 7,300 tons Project 15B guided missile destroyers being built for the Indian Navy (IN), in Mumbai on 20th April. IN officials said it would be commissioned in July 2018 and delivery of the three follow-on platforms at two year intervals will be completed by 2024 at an overall cost of INR 293.40 billion (USD4.89 billion). Key differences of Project 15A and Project 15B include the relocation of its sonar to the bow from the hull; the design of its mast, which houses its main radar, has also been revised to further reduce its radar cross section. Other changes include reshaping of the hull to accentuate its stealth features and the addition of a rail-less helicopter traversing system. According to IN, INS Vishakhapatnam would be fitted with the IAI-Elta-designed EL/M-2248 Multi-Function Surveillance Threat Alert Radar (MF-STAR) to provide guidance to 32 Barak-8/NG air-defense missiles. The destroyer will also be fitted with IAI-Elta EL/M-2238 S-band (2 to 4 GHz) 3-D volume air surveillance radar (STAR) radar and a Thales LW-08 D-band air search radar. INS Vishakhapatnam 's principal weapon will be 16 BrahMos anti-ship/ land attack cruise missiles, co-developed by the DRDO and Russia. A license-built 76 mm Oto Melara Super Rapid Gun, four Russian AK-630 close-in weapon systems and a 127 mm main gun, which is still under negotiation. It can also carry two multiple-role helicopters (e.g., Sea King or HAL Dhruv helicopters). Total Atmosphere Control (TAC) System; this system will enable the crew to operate the ship in regions of NBC fall out. According to Asian Defense military blog, "In its quest to become a powerful three-dimensional blue-water force and maintain a fleet of around 140 "surface and sub-surface combatants", the Navy already has 30 warships and six submarines on order in various Indian shipyards." Apart from this buildup of guided missile destroyers, Indian Navy is pursuing an ambitious $16 billion USD plan to modernize its surface and sub-surface fleets. Project-17 is yet another ambitious project to build 6,000 tons stealth frigates. According to Chietigj Bajpaee, an Indian defense analyst, Indian has ambitious plans for the development of a 160-plus ship navy, comprising three aircraft carrier battle groups by 2022. More than 40 warships and submarines are on order or under construction at the country's three major shipyards. These include stealth destroyers, anti-submarine corvettes and stealth frigates. These vessels will supplement and in some cases replace the country's older destroyers. According to some estimates, Currently, Indian Navy is the world’s fifth largest maritime force but it would take 3rd position, after China and US, within the next 15 years when Indian Navy would eventually complete its modernization. Indian security establishment and strategic community consider the rise of India’s trade through sea as the primary driving force behind this ambitious modernization as Bajpaee put it in his interview. But for a more objective analysis of this ambitious Indian naval modernization, the prevailing bitter truths of regional geopolitics like traditional rivalries between the countries like China-Japan maritime tension, India-Pakistan, India-China energy competition and China-US standoff over Taiwan, cannot be overlooked. These geopolitical realities have reshaped the Asian security architecture for the 21st century, where arms race, increased defense spending and a desire for ubiquitous military presence in the Indian Ocean are dominant trends. The strategic maritime competition between China and the US in the South China Sea is the biggest driver behind the Indian naval ambitions. As an indirect consequence of this strategic competition and Indian counter-strategy to it, the maritime balance of power in Arabian Sea between Pakistani and Indian naval forces is rapidly tipping in favor of India; thus creating serious maritime security concerns for regional stability and Pakistan’s seawards defenses. By looking at the design philosophy of Indian naval fleet, it becomes evident that Indian Navy is preparing for complete NBC/ WMDs scenarios. The pursuance of nuclear triad remains the ultimate long term objective in Indian strategic thinking to deter Chinese military modernization and expanding influence in the Indian Ocean. In this strategic milieu, the inclusion of stealth guided missile destroyers would further this growing maritime disparity between Pakistan and India. A scenario involving multiple Indian navy ships, armed with dozens of nuclear armed missiles, would be no less than a nightmare for small Pakistan Navy. Even we take nuclear WMDs out of the picture, the conventional arsenal of IN poses serious challenge to Pakistani naval installations and other industrial targets. The establishment of NSFC, back in May 2012, was perceived as Pakistan's announcement of existence of country's maritime strategic deterrence in form of a nuclear submarine project. Back in 2012, ISPR issued its press release which read, "The force, which is the custodian of the nation's 2nd strike capability, will strengthen Pakistan's policy of credible minimum deterrence and ensure regional stability.” This statement cemented the impression further that Pakistan having nuclear submarine program. It has been three years since the NSFC was established but still Pakistan's surface fleet remains precariously exposed to Indian Navy's overwhelming technical and numerical superiority in Arabian Sea. Nation is still looking towards the strategic decision makers and security managers to put Pakistan's 2nd strike capability in operational state in order to give PN much needed deterrence capability. PN currently does not operate any single ship armed with long range land attack cruise missile to give it a true guided missile capability. Although, the Ex-Type 21 ships (Tariq Class) acquired from the UK in 1993-94 are classified as destroyers in PN but fact remains that these ships were built as frigates originally. These PN Ships were rearmed with American and Chinese anti-ship missiles (Harpoon and C-802). But Harpoons do not give any advantage to Pakistan Navy as Indian Navy has also acquired Harpoon Block II missiles (Range 130 Km) for its latest P-8I MPA aircraft. But Pakistan's maritime security worries in context of Indian naval modernization do not end there; PN's sub-surface fleet, which can provide a considerable deterrence and sea-denial capabilities against enemy's overwhelmingly larger surface fleet is also precariously out numbered. PN currently has only 5 conventional submarines (3 Agosta 90-B and 2 Agosta-70) and 2 Agosta-70s have reached their retirement age. Since 2010, PN has been looking for various options to strengthen its submarine fleet but so far no confirmed deal has been signed. Latest news suggest that PN may eventually acquire Chinese made conventional diesel submarines. Originally, PN requires 12 submarines. This requirement was laid out in Armed Forces Development Plan (AFDP) 2015. It is high time for PN to expedite the acquisition process. Apart from getting Chinese submarines, Pakistan is also looking for surplus Western subs. In this pursuit, Turkey can provide Pakistan with German Type-209 submarines which it wanted to modernize but then went for latest Type-214. Pakistan also needs to increase the strength of its surface fleet. News is that PN is considering to acquire 4 more F-22P type frigates. Pakistan must look at the potential acquisition of Chinese destroyers. Chinese platforms would allow Pakistan to integrate Pakistani cruise missile Babur on them giving Pakistan the deterrence against the maritime threats from India. Pakistan Navy cannot match its Indian counterpart one to one basis neither it is required keeping in minds the size of Pakistan's Exclusive Economic Zone (EEZ) and coastline length. But then there is a third and more relevant factor in this equation of indo-Pak maritime power projection which PN will has to balance. The third factor is growing expeditionary nature of Indian Naval modernization. Evidently, Indian Navy is seeking to build ‘army maneuver through sea’ capability in joint ops doctrine with Indian Army. Minimum credible deterrence threshold for maritime arena, in Arabian Sea, will have to be redefined by PN. The share of Pakistan Navy in annual defense allocation must also be redefined as per this reevaluated minimum credible deterrence parameters in maritime power projection. Acquisition of more F-22P frigates and some Chinese built destroyers would become the eventual consequence of any such reevaluation. PN will have to become a capable brown water navy with limited expeditionary capabilities. Pakistan Navy needs to take a page from Pakistan Air Force’s (PAF) success in self-reliance in ship building. Just like PAF’s JF-17 Thunder, PN needs to initiate a joint venture with China or Turkey to design and build indigenous destroyer. Pakistan must become a player in the geopolitical game being played in Indian Ocean rather than being a pawn. Building a strong ship building industry is also vital for Pakistan from pure economic perspective. It can attract foreign customer and earn foreign reserve. But this is a mid to long term plan. For now, the most realistic option for Pakistan would be to concentrate on enhancing two basic maritime capabilities against the Indian Navy's surface fleet at war footings i.e. Sea denial and Coastal defense. For rapid sea denial, what Pakistan Navy can do is to concentrate on aerial operations capabilities in open Ocean and raise the number of missile boats in surface fleet. Pakistan Air Force has already expanded the operational orbit of JF-17 with integrating CM-400AKG hyper-sonic anti-ship missiles. Both PAF and PN must expedite the deliveries of these planes to PN. According to media reports, PN is interested in 30 JF-17s to raise 2 squadrons. Air launched version of C-802 anti-ship missile is also being integrated on Thunders, Keeping in mind the size of Mig-29K and Su-30MKI fleet of Indian Navy, Pakistan Navy must revised its requirement for JF-17s to 60-70 to raise minimum 4 squadrons. How these aircraft integrate with existing fleet of Pakistan naval aviation wing would determine their effectiveness during the actual air-sea battle. For coastal defense, Pakistan has built fast missile boats, these small boats can prove invaluable defense against growing numbers of Indian guided missile destroyer fleet. These boats are easier to build and maintain with minimum resources and time. Media reports suggest that Pakistan has increased its requirement of Azmat class Fast Attack Craft (FAC) to 8 from current strength of 2. It will help in coastal defense but due to their limited green water capabilities (shorter range, lower displacement) they cannot perform sea denial operations in open sea far from coast line but these ships (each armed with 8 C-802) are in-arguably the best option for coastal defense. It will be only prudent to remind once again what renowned American maritime strategist Alfred Mahan once said about the Indian Ocean and its importance in the 21st century when global trade has made this Ocean strategically the most important geography on the globe.